Ciney (formerly spelt Chiney, pop. 15,000) is a small town in the middle of the Condroz region with a history going back to the Roman period. It is not really a tourist destination but is at least famous for two things : its beer and its cattle. Beer has been brewed in Ciney since 1450. The modern 'Ciney beer' is either "blonde" or "brown", and the brown version is one of Belgium's most famous, which says a lot. 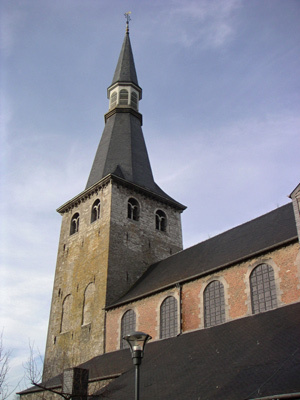 The belltower of Ciney's collegiate church features on the beer label. Ciney has the largest cattle market in Belgium, with 4,000 animals passing there each week. 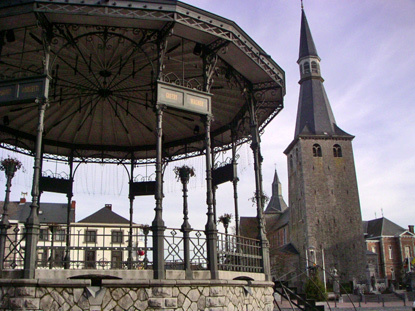 Ciney calls itself the capital of the Blanc Bleu Belge (li. "Belgian White & Blue" cow), i.e. beef from Frisian (Holstein) cows, one of Europe's most reputed. It is no wonder under these conditions that Ciney should also have a lively Institut Supérieur d'Agronomie (Agronomy College), forming a lot of Wallonia's farmers. Ciney's cows are also famous for having started the famous Guerre de la Vache (War of the Cow) in the Middle Ages. If you happen to pass through Ciney, you can stop and eat a beef steak with frites (chips/fries) and a Ciney beer at a local restaurant. Ciney is 30 min by train from Namur on the Brussels-Luxembourg line. By car, it is about 25 min from namur on the N4 motorway.